–	How do you, who contributed a share of the proceeds of some Madison Square Gard Concert tickets to a Global Fund, Improve the world to be AIDS, Tuberculosis and Malaria Free? I am awaiting John Legend’s replies. It's an honor to be able to ask a few questions to such an innovative (and emotionally stirring) musician! -One of your greatest talents is in collaboration with other legendary artists (no pun intended). If you could make music with anybody, living or dead, who would it be? -Throughout your career, you've masterfully transcended genres, covering everything from Soul to Hip Hop to Reggae and more. What type of music would you like to tackle next? Your "Show Me" campaign made a huge impact on the parents here in Chicago via Etoy Ridgnal (Stand for Children), and I want to extend a HUGE thanks to you for this philanthropic gesture! You truly remembered the "Ordinary People". We love you, John, and may God continue to bless you in the almighty name Jesus. I am curious to know about the reality of the illuminati in the entertainment business; Question, what's the reality? Your music is beautiful and transcendent. Can you talk about your process as a song-writer? I'm thinking of proposing to my girlfriend on Friday during your lecture/concert at Butler University, I don't suppose you can sneak PDA into your set list while talking about the American education system? Probably not the best venue, I'll admit, but no harm in asking. I'd like to also commend you in your mission to reform the education system, I'm curious what inspired you to become so involved in the education debate? Hello John, what process do you take when writing songs? Do they just come up in your mind? or do you elaborate on them as you go? Remember the first time i heard you, that song "ordinary people" you sounded like the finest angel from heaven singing peace to the troubled earth. you're awesome! Do you count your voice uniqueness as product of sheer gift or the result of hard work( voice training and all those vocal gymnastics stuff people try). Legend you are, legend you always will be! I wanted to know if you still get nervous performing? What do you do to calm your nerves? Hullo John. How long do you rehearse before album release? What hint do you have for artiste in the offing, especially in underdevelope Africa? Lagos, Nigeria. Ques.-how can someone become a music star. Hi, John Legend, i love you and your songs, wishing you good luck, because inspirational words and wisdom is better than money, when you have it, it make you live better and also have peaceful money, not live or die trying to get money means, Thanks. From Paul Cletus, Lagos, Nigeria. Hi JOHN LEGEND n the CNN CREW,i would like to know what inspires u towards music?,n how was it when you were growing into music? Henry from Nigeria. i see dis as an opportunity and tank God 4 CNN, is there any other ways ur fans can meet or chat with u? john were do you get ur inspiration n lyrics from. Pls can u tel me d title of the song u sang alongside pink and two old men? John, what (or who) was the inspiration for the song Ordinary People? Am Shola from Nigeria,I want to ask you what is the force that has been driving you in your career? Hi John. You've been a source of inspiration to many artist in the Gambia, most especially NOVA Who sang WHY NOT GAMBIAN. None of this guys have a record label. What advice do u have for them. 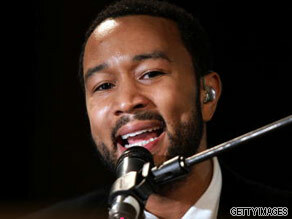 John Legend signs to makes pianticolis be aware that the people matter. All they do are for the good of their constituents. Tax cuts should not provide problems for the people.